By Peter Anderson Leave a Comment - The content of this website often contains affiliate links and I may be compensated if you buy through those links (at no cost to you!). Learn more about how we make money. Last edited April 9, 2015 . 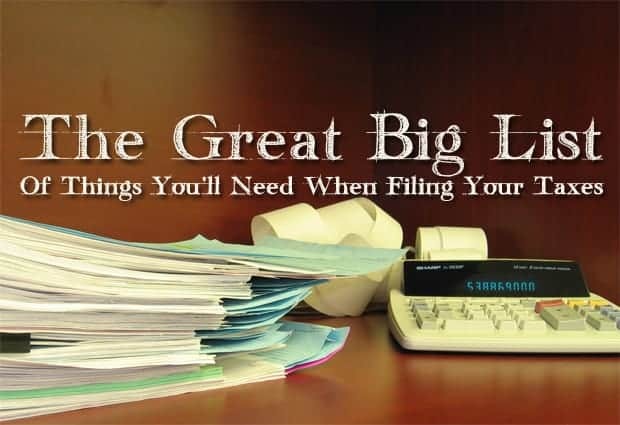 The tax filing deadline is quick approaching, and if you haven't already you'll need to pull together all of your paperwork, receipts, tax reporting forms and more. The problem is this – you only do your taxes once a year, and it's not always easy to remember everything that you need to have ready to go when it comes time to file. Today I though I would do a quick once over and take a look at some of the key things you'll need to pull together to do your taxes. When doing your taxes there are a lot of things you'll need to remember to have handy. You'll need to have your personal information, information about your income, information about income adjustments, taxes paid as well as itemized deductions and credits. So let's get started. What personal information should you have handy when doing your taxes? Date of birth for you, your spouse and all dependents. Tax returns for the last two years for you and your spouse. Information about your occupation, as well as your spouse's occupation. Change of address (if you moved). Next up you'll want to have forms for all of your income sources. W2s for you and your spouse's employment income. 1099-MISC forms for any independent contract work you performed. 1099-INT interest income, 1099-DIV dividend income, 1099-OID. 1099-C cancellation of debt forms. 1099-R distribution from IRA, 401k, etc. 1099-S forms for income from sale of a property. SSA-1099 for Social Security benefits received. Business or farming income details. Form 1098-E for student loan interest paid. Form 1098-T for tuition paid. Receipts or canceled checks for expenses paid for classroom supplies, etc – for teachers. IRA contribution records for the year. Receipts for qualifying energy-efficient home improvements. Records of health savings account contributions. Self-employed health insurance payment records. Itemized records of moving expenses. Keogh, SEP, SIMPLE and other self employed pension plans. There are a host of deductions and credits you can take advantage of in order to lower your tax burden. Who wouldn't want to take advantage and keep more money in their pocket, right? Form 1098, record of mortgage interest paid, private mortgage insurance (PMI) paid, and points paid on any mortgages. Child care costs including provider's name, address, tax ID and amount you paid. Education costs via form 1098-T. Adoption costs. Make sure to have the Social Security number of the child, and records of legal, medical and transportation costs. Charitable donations that you made including cash amounts (like cash donations to a church), donation receipts, value of donated property. Medical and dental expense records, to take deduction for costs greater than 7.5% of AGI. Records of miscellaneous tax deductions for un-reimbursed employee expenses, union dues, etc. Home business expenses including home and office size for home office deduction. Business use of a vehicle expenses including log showing total miles driven (other than commuting), parking and tolls paid, receipts for actual expenses. You'll also want to have a record of the taxes that you've paid throughout the year. Vehicle license and registration fees. In some limited cases you might need the following information handy at tax time as well. Estimated tax payments you've made if you're self employed. If you're a blogger like me, you'll need this! Prior year refunds that were applied to the current year. What Does It Cost To Prepare And File Your Taxes? Tax filing costs are going to vary pretty widely depending on how you file (paid tax preparer vs. doing it yourself), what your income level is (There is a free-file option for some lower income folks) and other factors. Using an online software costs: Anywhere from $80-120 on average, depending on your filing options, number of state returns, etc. (source). Of course some software like TaxACT starts free for some filers! So that's a quick look at what information you're going to need handy come tax time. Did we leave something off the list? let us know in the comments! Last Edited: 9th April 2015 The content of biblemoneymatters.com is for general information purposes only and does not constitute professional advice. Visitors to biblemoneymatters.com should not act upon the content or information without first seeking appropriate professional advice. In accordance with the latest FTC guidelines, we declare that we have a financial relationship with every company mentioned on this site.